LAWRENCE — At the same time concerns about diminishing honeybee populations continue to rise, North America’s 4,000 species of native bees are getting more attention. National Geographic magazine published a story last year with up-close images of many bee species, and its article “Intimate Portraits of Bees” is still online. But populations of wild bees, which, unlike honeybees, are largely solitary, also are declining. Factors such as habitat loss and fragmentation may adversely affect their ability to find food sources and nesting sites. In response, “bee hotels” are springing up all over North America and Europe — including one installed May 2 at the KU Field Station, just north of Lawrence. Bee hotels, which range from small boxes with a few drilled holes to clean-lined architect-designed pieces to elaborate works of art, provide nesting sites for many types of bees. Their names — leaf cutter bees, carder bees, mason bees, resin bees — refer to the types of materials they use to build nests, which are made up of series of individual brood cells. 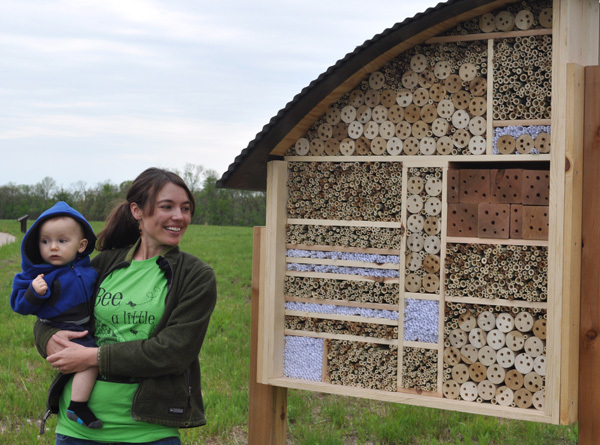 “The bee hotel adds another educational layer of interest to the features of the Rockefeller Prairie Trail,” said Scott Campbell, outreach and public service director for the Kansas Biological Survey, which manages the KU Field Station. The Rockefeller trail, part of the Field Station’s five-mile public trail system, is ADA-compliant and runs along native and restored prairie. Amenities include interpretive signage, a restroom, a drinking fountain and benches. At the trail’s turnaround point, the Overlook deck, built by KU architecture students, offers a view across the Kansas River valley to Mount Oread. The Field Station’s bee hotel was conceived and built by the employees, along with their family members, of PROSOCO Inc., a building products company, and Clark Huesemann Architects, both of Lawrence. It was undertaken as a volunteer project through the U.S. Green Building Council’s Green Apple Day of Service. The Kansas Biological Survey was established at KU in 1911. The Field Station is devoted to scientific research and education and totals 3,400 acres across 10 tracts in Douglas, Jefferson and Anderson counties. Photo: Daphne Mayes, doctoral student in ecology and evolutionary biology, provided outreach education for construction of the bee hotel. She attended the dedication of the structure May 2 with her family, including her young son.